Pallet Rack is the ultimate solution for heavy-duty racking when substantial loads or the use of handling equipment rules out Wide Span. Maximize safety within your budget constraints by choosing from a variety of deck and beam options. Madix's Pallet Rack line also offers more accessories than the typical racking competitor. Available in two standard colors, Pallet Rack can also be painted to match the colors of other Madix fixtures, making it suitable for sales floor applications. 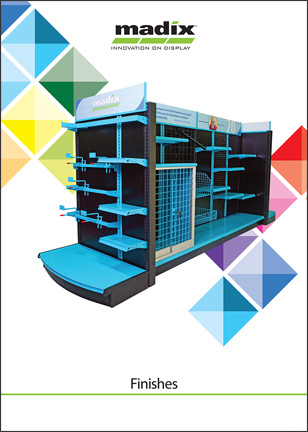 Wide Span serves either as an attractive sales-floor bulk merchandiser or as an efficient warehouse storage rack of hand-stacked inventory. It is often used when bulk or loads preclude the use of storage shelving. Wide Span is manufactured of heavy gauge, high-tensile steel. Wide Span is available with a number of deck and beam options to safely match what you need with your budget. It assembles quickly and has many accessories. It is available in two standard colors or finishes that match Madix's display fixtures. Madix outfits pharmacies with its display shelving for the sales floor and its Rx fulfillment lines for work areas. The company's display products improve sales out front, and its service counters and modular pharmacy shelving advance productivity in the back where pharmacists talk to customers and fulfill prescriptions. Many storage problems are solved by use of sturdy, economical Madix Storage Shelving. All hanging and packaged garments, shoes, general merchandise, auto parts, and most industrial goods are easily accommodated with this product. Madix's unique interlocking upright/retainer design features ease of assembly, strength, durability and 1" adjustment of shelves and accessories. A complete line of accessories is available. Painted parts are finished Blue Gray or Sahara for a durable and attractive appearance. Wood shelves are high density particle board. Wire grid shelves, 3" OC grid, also available. The space-utilizing Catwalk System is designed to eliminate storage issues often plagued by downsized backrooms. The issue of storage space is often a crucial element in dealing with an efficient backroom. Catwalk System resolves this issue by creating a complete second floor that practically doubles the usable storage space. This custom backroom solution consists of joists, hangers, steel planking, staircases, protective railings, and wire panels. Contact your Madix Sales Representative for ordering information or visit our Sales Assistance page. Madix’s Mobile Storage Systems create high-density storage while maintaining easy access to inventory. Retailers can reduce operating costs and conserve valuable floor space to maximize their front-room display area without increasing their overall store size. Montel, a world leader in mobile storage solutions and Madix’s strategic partner, provides systems that range from the basic “SmartSpace” manual carriage to fully powered systems. Specially engineered systems are also available, so storage capacity is virtually unlimited. For ordering information, please contact your Madix sales consultant. Mobile Storage System is a major component to Madix's new BOPIS Solution.